STAY—High, middle and low class hotels ,rest houses, lodges dakbunglow, dharamsala ,youth hostels etc are available of ones own choice at moderately affordable charges . FOOD_Hindustani ,specially Bihari rice,pulse, litti , chatni, cho kha , dosa , idli alongwith fast food and variety of sweets and puddings etc are available. Non-veg food can be had in plenty. Local special non veg dish is Bagery Harial, Titar, Bater etc are available in central Patna. DRINK_ Sweet drinking water is available in plenty. Besides, it soft and hard both can also be had easily. is about 5.5km. It was completed in 1982 and opened to public by Smt Indira Gandhi the then Prime minister of India.It has 48 intermediate spans of 121 meters each resting on 50 pillars. 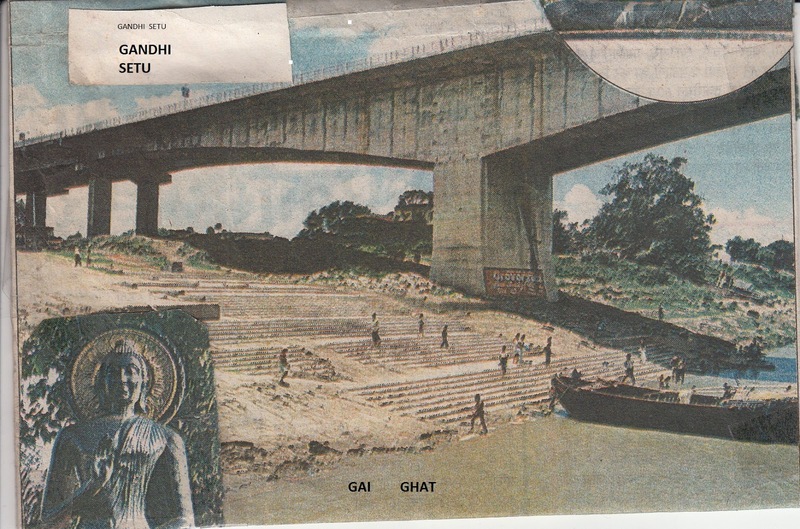 The bridge is named ‘ Gandhi Setu ‘because Mahatma Gandhi or the father of the nation crossed the Ganges on boat to visit Champaran and started his freedom movement by disobeying laws against cultivation of Nil. It is also also called Gai ghat bridge. Because from very old days, people of both sides of the Ganges used to ferry their cattle to and fro for various purposes. The reason may be low depth profile of the river at this place. It is also called Gai ghat Tirth because Ram along with Lakshman and his teacher saint Vishwamitra to go to Janakpur in mithila and married Sita, Krishna crossed the Ganges at this very place while traveling from Kurukhetra along with Bhim and Arjun and went to Rajgir via Gorathgiri now Brabarhill and got victory over Jarasandh by Bhim in wrestling. At present it is earmarked ghat on the South bank of the Ganges below the Gandhi setu. Now it houses headquarter of River Marine Transport Cargo and Shipping establishment and School of Marine Institute .Shiv Mandir, Durga Mandir and Gaighat gurudwara are little southward .